Trips to the groomer can be expensive for a large dog. If your pup just needs a bath without a haircut, you may be better off washing your large dog at home. Too bad your dog is too big to just stick them in the kitchen sink, right? That’s why we have these tips on how to wash your big dog at home. I was a dog groomer for 12 years, and I want to give you tips to make sure the process goes as smoothly as possible for both you and your pooch. 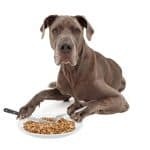 You may not realize this, but a mistake on your part during what seems like a simple task can lead to a trip to the vet later. 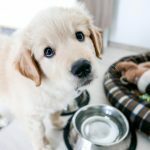 Why Wash Your Large Dog at Home? Taking your large dog to the groomer can be expensive, even without a haircut. 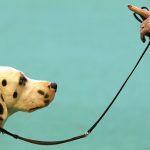 It can also be stressful for dogs with separation anxiety, kennel aggression, or a fear of the hair dryer. Good groomers can also be booked out days or weeks in advance, which does you no good when your dog rolled in something nasty and needs a bath TODAY. Sometimes bathing your dog at home is the best option, even if it isn’t the easiest. 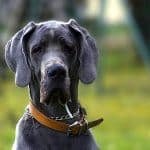 Washing your large dog at home can be stressful at best and lead to a vet visit at the worst, so here is some helpful advice to make the process a positive one for you and your furry pal. If your large dog has hair longer than a Labrador Retriever, you’re going to want to brush them BEFORE the bath. Water can make mats worse, especially if you don’t use a high-velocity dryer afterward to blast them apart. If you want advice on how you can use conditioner and a high-velocity dryer to loosen mats up during the bathing and drying process, read this article. Otherwise, you’re generally going to want to get as many mats and as much undercoat out of your dog as possible before the water from the bath makes things worse. 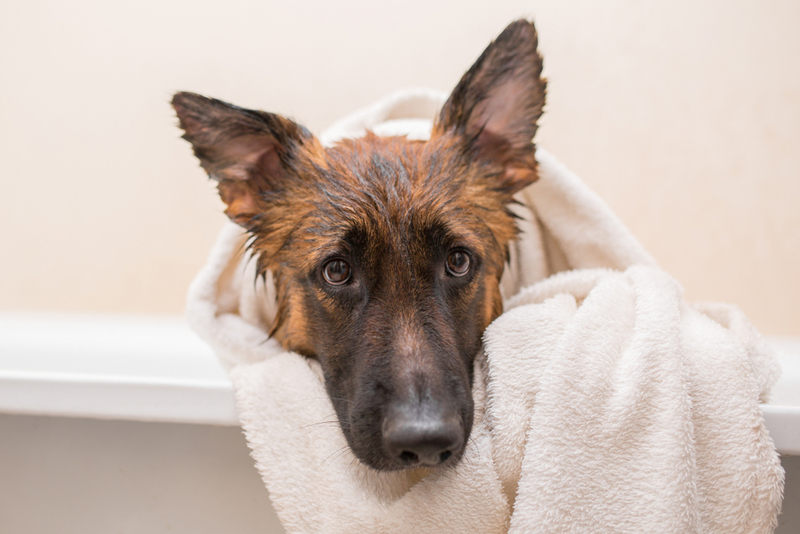 If your dog is less than thrilled about getting bathed, you’re going to want to make sure you have a way to control them during the bath. If you’re washing your large dog outside, then putting their leash and collar on and tying the leash to something sturdy may work. 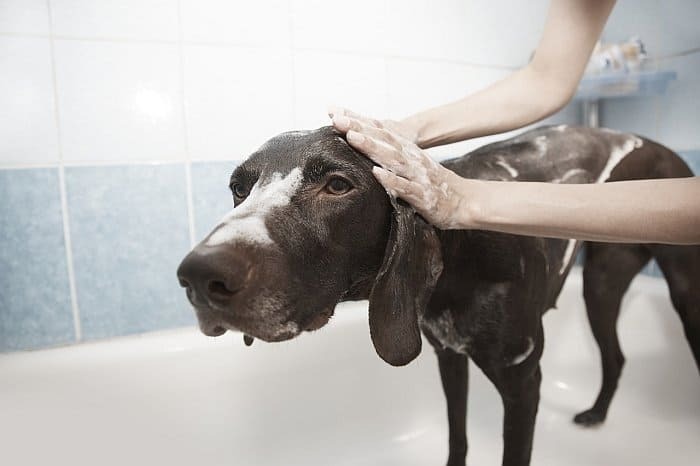 If you’re washing your dog in your bathroom, you may need somebody to help you keep your dog calm and in the tub or shower while you focus on scrubbing and rinsing. This step is more important than you may realize. Before putting your dog in the tub, you’ll want to make sure your dog has a stable surface to stand on. If you don’t have an anti-slip mat in your shower, lay down a towel so your dog has more traction. A dog who can’t get a grip on a slippery tub floor is more likely to panic during a bath. Start by using lukewarm water to get your dog wet. Dogs don’t enjoy a hot shower the people do – they can overheat. 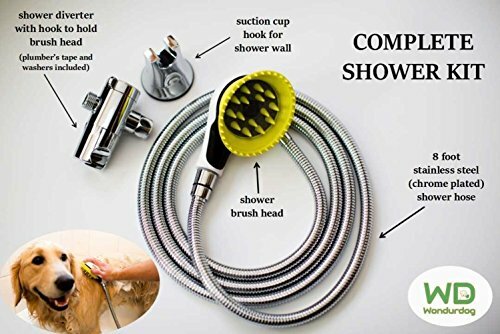 You can use a garden hose if you’re outside or you can buy a dog shower kit that attaches to your shower head for bathing your dog in your bathroom. Get their body wet before moving on to their face; you wouldn’t want somebody unexpectedly blasting you in the face with water, would you? 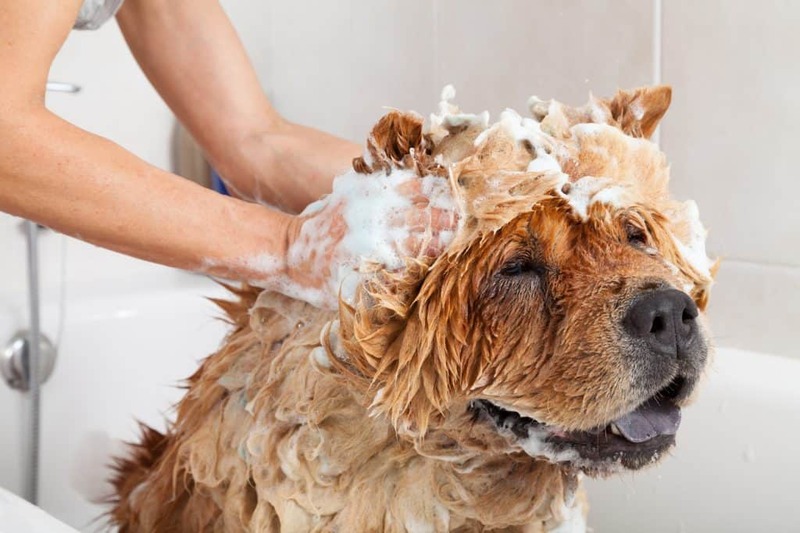 Make sure your dog is wet all over before adding shampoo to get the best lather. It’s crucial to use a shampoo made specifically for dogs because humans and dogs have different acidity levels in their skin. That means that even baby shampoo can be very drying on a dog’s skin. You may also want to use a dog conditioner to help moisturize your dog’s skin and coat. As you wash your dog, be sure to avoid getting shampoo in their eyes. Even tearless shampoo can cause ulcers if it gets in your dog’s eyes. For extra protection, use a plain saline solution made for human contact lens wearers in your dog’s eyes before and after the bath to help flush out any shampoo that might get in their eyes. One of the most common ways that dogs get ear infections is getting water in their ears. To help prevent ear infections, put a piece of cotton in each of your dog’s ears before the bath to reduce the chances of water getting in there. 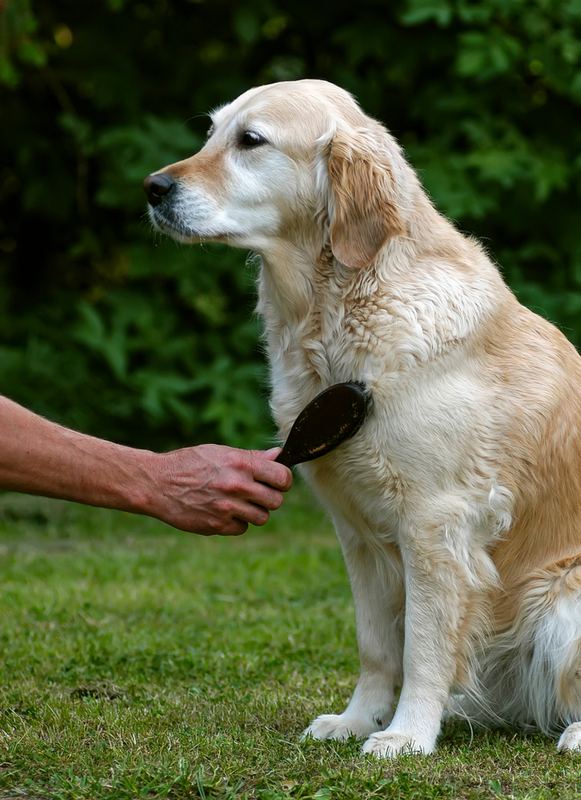 After the bath, use a dog ear cleaner to clean out any wax, debris, or water from your dog’s ears. A rubber curry brush can help you rub the shampoo all the way down to your dog’s skin if your dog has thick fur, and it can loosen up undercoat and help it rinse out in the bath rather than falling out on your floor later. We all know how hard it can be to cut thick dog toenails. 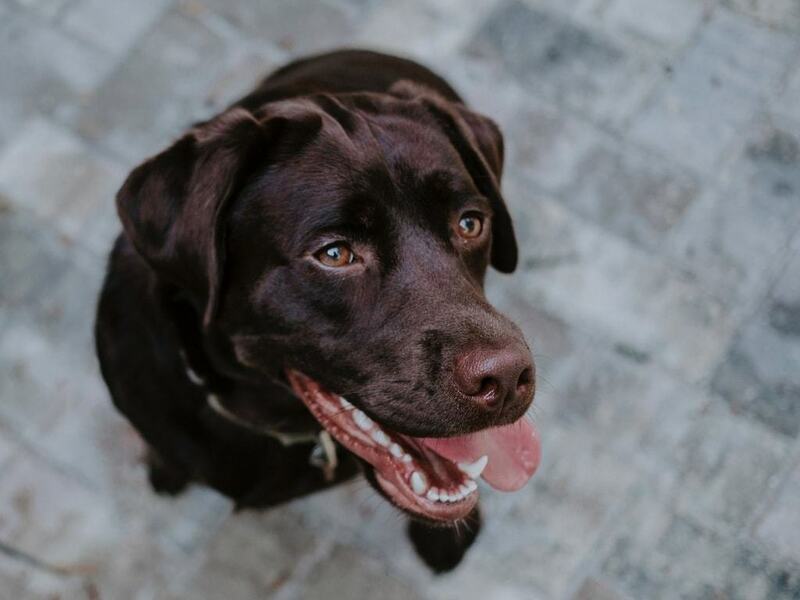 Dog nails soften up when they’re wet, and dogs are sometimes less resistant to having their nails cut when they’re enduring a bath, so it’s handy to cut your dog’s nails while they’re soaking in conditioner or medicated shampoo. Even when you think you’ve gotten all the shampoo out of your dog, keep rinsing for a few more minutes. 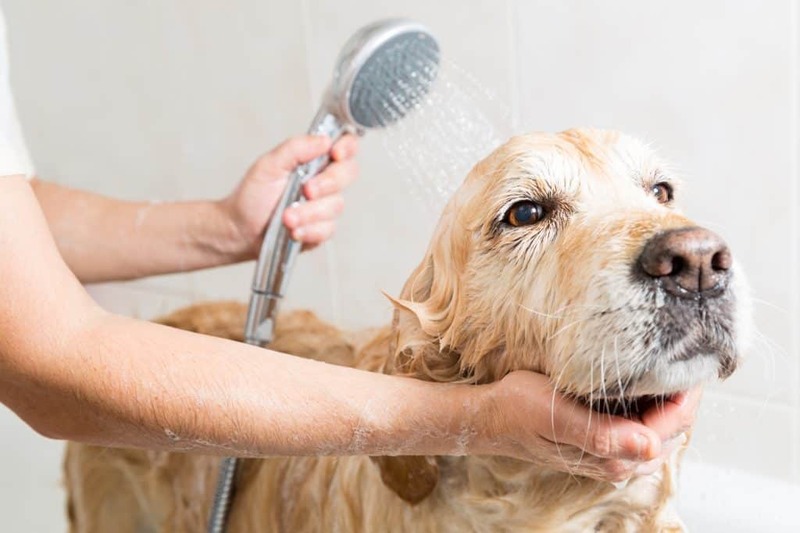 Leftover shampoo residue can cause a variety of problems from excessive itching and flakiness to hot spots to bacterial infections that require treatment from a vet, so it’s critical to get every last bit of shampoo out of your dog before calling them clean. 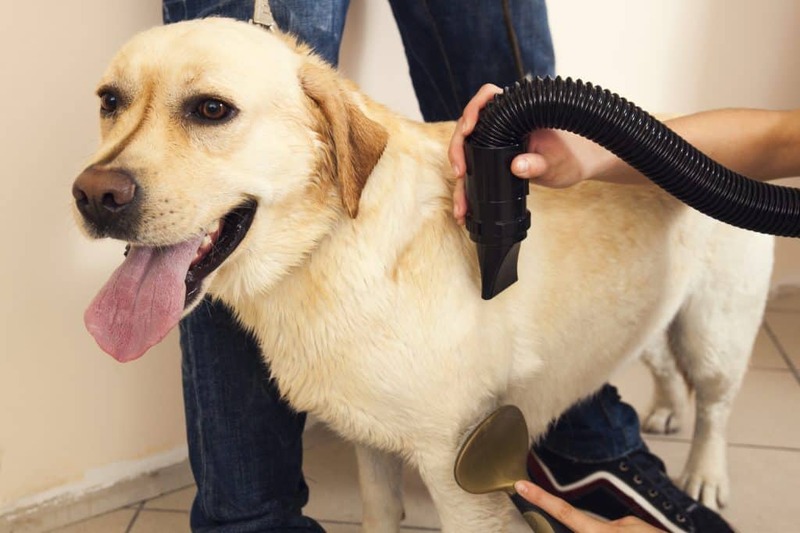 While you can choose to towel dry your dog and let them run around until they air dry, many big dogs shed a lot, and a high-velocity dryer can help remove massive amounts of undercoat before your dog has a chance to shed that fur all over your house. 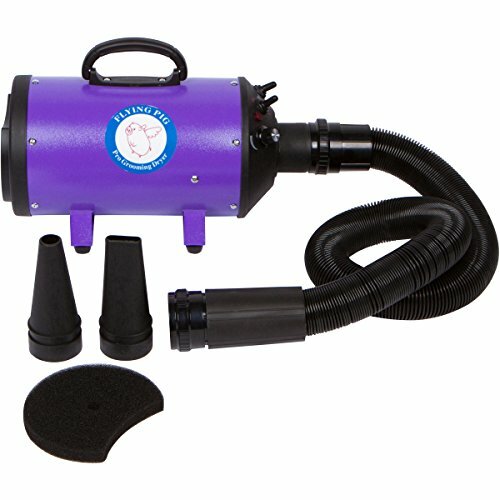 High-velocity dryers work by blasting water and loose fur off your dog, so use it outside or in a garage if you can. Otherwise, use it in the bathroom and be prepared to clean up a mess. In addition to blasting out the undercoat, a high-velocity dryer can straighten curly hair, fluff up dogs with thick hair, and loosen mats. Check out this article for more of my tips on how best to use a high-velocity dryer on your dog for best results. Few dogs enjoy bath time, although many will tolerate it. The best thing you can do to end a bath with your dog is to give them their favorite treat. That treat will hold even more value if it’s something they only get after a bath, so they’ll have even more incentive to tolerate the next bath. 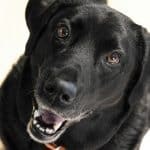 While washing your large dog at home can be a messy experience, it’s the best way to know what products are being used on your dog and it’s much cheaper than taking them to a groomer. Hopefully, these tips help your next bath go smoother than ever!